The appearance themes screen is a great solution if you want to manage your Themes. It allows you to install, activate Themes as well as to update or delete them. Through two tabs Install Themes and Manage Themes (the default view) you can always configure your Themes the way you want. WordPress Themes are a number of files which create a visual interface as well as the unified design for a blog. These are the template files. A Theme changes the way of how a site looks like without changing its underlying software. Themes may consist of image files (*.jpg, *.gif), code files (*.php), custom Pages, style sheets (*.css) as well as customized template files. You can see your current active Theme in the upper left corner of your site. Traditionally, the WordPress Twenty Fourteen theme is displayed during the installation. The “Theme Details” button will show you the title of the Theme, the author, the version as well as a short Theme description. Below you can see additional buttons which activate the appearance screens of a specific current theme. You can pick them in the menu on the left. The Manage Themes screen remainder displays the rest of installed Themes. Fifteen Themes per page are displayed, so if you have more installed Themes, they will be placed on the next page. You can see a small screenshot of each Theme as well as your Current Theme image. If you roll over the image, you will see “Activate”, “Live Preview” and “Theme Details” buttons. Click the “Theme Details” to view the Theme title along with a short description of the Theme, the Theme author and the Theme version. The “Theme Details” panel has buttons which allow you to Activate and to see a Live Preview of the Theme. Also, find links to Delete or upgrade the Theme, if available. Click on the link to remove your theme completely. All Theme folders and files will be deleted as well as your customizations. Please, use backing up before deleting. If there is an update available for your Theme, you will get a message about the new version. Below you will see a description of each of these methods. It is an easy way to install a Theme if it is in a ZIP file. You can upload any Theme in the WordPress Theme Directory. Find the Theme you want to install and download the Theme ZIP file on your computer. Go to Administration > Appearance > Themes and click the Add New button there and click the Upload link. Browse your Theme ZIP file click Install Now. The installation screen will list the installation. Click the Activate button to make the uploaded Theme the current. It is another easy way to install a Theme and it also can be used in the WordPress Theme Directory. Go to Administration > Appearance > Themes and click the Add New button. You can find your Theme with the help of the keyboard search, attribute search or filter search. Keyboard search – type a keyword and click the Search button. Attribute search – fill the attribute fields like Subject section, Width, Colors, Columns and click the Find Themes. Filter search – find three filters on the top of the screen. Those are Featured, Newest or Recently Updated Themes. When you see the search results, click Follow the Preview and Details buttons to find more information. Use the Live Preview button to make a final look on the Theme before installing it. If you like the Theme, just click Install Now. It will appear on your page. Click the Activate button to make this Theme the Current one. This method is a little bit more complicated than the previous ones. However, you can also use it if necessary. Download the Theme ZIP files to your machine and extract the contents to a folder on your hard drive. When extracting these files it is better to preserve the directory structure in the archive. When finished, follow the Theme author`s guidelines. Enter your host web server using an FTP client. You may need to create a directory for the Theme files in the wp-content/themes directory provided by WordPress. E.g. a Theme named “Black” should be in wp-content/themes/black. This directory may be a part of the archive provided by your Theme. On your host web server, upload the Theme files to the new directory. Go to Administration > Appearance > Themes and click the Activate button to make the Theme, the Current Theme. The following instruction can be applied if your host server offers the cPanel. Download the Theme ZIP files to your local computer. Find the cPanel manager and go to your Themes directory. If your WordPress is installed in its own directory named “wordpress”, go to “public_html/wordpress/wp-content/themes”. If not, that is WordPress is installed in your web-root directory, go to “public_html/wp-content/themes”. When you’ve found the Themes directory in cPanel File Manager, upload that ZIP file you saved in Step 1 with the help of the Upload button. As soon as the ZIP file is uploaded click on its name in cPanel. Then choose the Extract File Contents option in the panel to the right to uncompress the file. To add a WordPress Theme is a perfect way to decorate your page. Installing a new WordPress Theme is easy and fast. Just choose one of the methods listed above and follow the instructions. 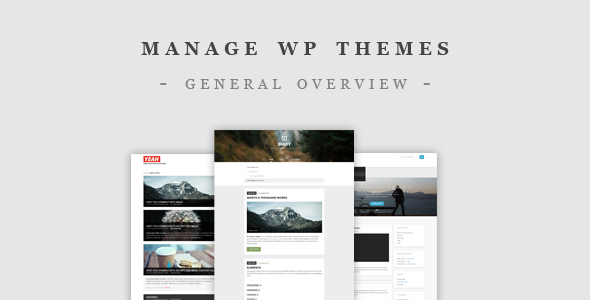 It is also simple to manage the WordPress Theme, you can do it with a pair of clicks. Pick a stylish Theme and your page will always be in trend. Free vs Paid WordPress Theme: What to Choose?